Oya, Armenian lace: what difference? I was very happy to be able to use my DMC pearl cotton #12. It is fine, but with poor lighting, I did not see the color well … damn! Anyway, I spent some time researching oya and Armenian lace. I am giving you a summary here, as well as some interesting links for who wants to try. Knotted Mediterranean lace is known by many different names, including Armenian lace, igne oya, bebilla, Nazareth lace. It is a cultural tradition of the eastern Mediterranean countries that are Greece, Cyprus, Syria, Turkey and Armenia, among others. According to Catherine Amoroso Leslie in Needlework Through History: An Encyclopedia, there are two distinct styles: oya and Armenian lace. – Armenian lace is a monochrome lace made with a very fine cotton thread to adorn a girl’s trousseau, clothes and objects for the church. The Priscilla Armenian lace book talks about cotton yarns between sizes 20 to 80. Also other sources speak of size 100 or sewing thread. – The oya igne is characterized by 3D patterns and a wealth of colors. Originally the threads used were silk threads. The women decorated their scarves with representations of flowers, the type of flower according to their age. 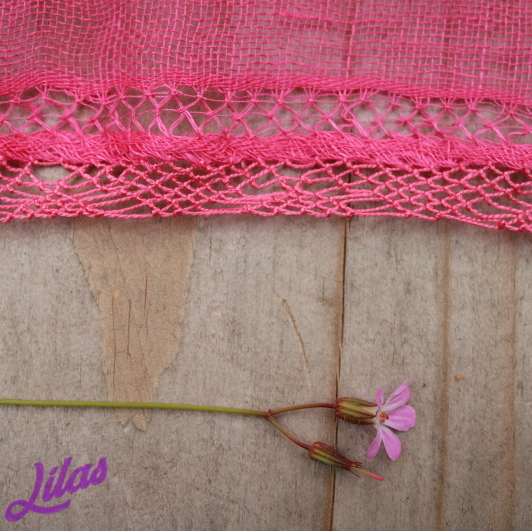 Grandmothers used small wild flowers that symbolize the ephemeral nature. Young girls, brides and young women used roses, carnations, jasmine, hyacinths, violets, sunflowers, chrysanthemums and fuchsias … All these flowers had a meaning depending on their type and color. Nowadays Turkish women use polyester threads for oya. It is inexpensive, very bright and allows quick finishes since it only takes a lighter to solder the threads at the end of work.Beyond these differences, these two knotted lace uses very similar techniques. It is possible that the Armenian needle lace existed 3000 years ago. In her book, Armenian Needlelace and Embroidery, Alice Odian Kasparian says she believes that Armenia must be the real home of this type of needle lace. She quotes four archaeological finds as evidence. According to other sources “Turkish lace” or “Oya” dates back to the 8th century BC to Phrygians in Anatolia. Some sources describe this type of work in the 12th century in Greece, Italy and the rest of Europe.